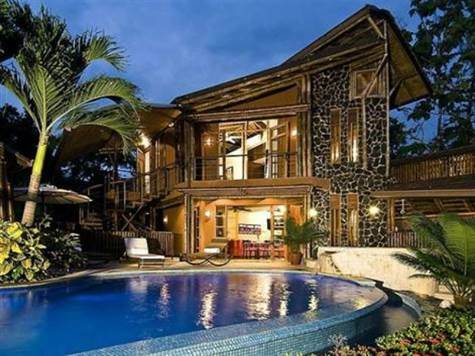 Casa Ramon is the most exquisite and unique piece of tropical architecture design combined with the magic of the ocean breeze and tropical rainforest ambiance of Dominical and Puertocito. A custom design, built to last and to satisfy the needs of the distinctive owner wanting the best out of privacy, uniqueness and quality. The incredible tropical mansion in Costa Rica is more than 1,000 m2 of luxury and comfort made out of exotic woods, bamboo, river stone, marble and porcelanato floors, Brazilian granite, coralline stone and the best techniques of anti-seismic construction. Special light features made by USA designer especially for the house. This property has everything for maximum privacy, comfort, entertainment, and relaxes: two master bedrooms downstairs, a master suite upstairs with bubble bath Jacuzzi and another master bedroom. A beautiful guest house is located next to the pool area. Nine bathrooms in total in extreme minimalist style combined with tropical architectural details. Ample social areas with magnificent views of the ocean open up to the great terrace and swimming pool area. Third level is an ample terrace and BBQ area, ideal for maximum enjoyment of the sunsets and clear nights. 15 feet height ceilings on top of two ample living rooms, two fully equipped kitchens, up to the highest standards of luxury, one upstairs and one downstairs. Additionally, you will have a very nice guest apartment attached to the house, or employees’ ´s quarters. The outdoors feature sophisticated multicolored lighting system in gardens, pool and Jacuzzi areas mixed with the lights of the most spectacular sunsets. Additional features include manicured grounds, automatic irrigation system, water fountains and ample parking facilities. This is the ideal home for the discriminating buyer looking for maximum privacy while enjoying the gifts of nature. TASTEFULLY FURNISHED AND FULLY EQUIPPED TO THE HIGHEST STANDARDS. This is a turned key deal.